In the third HD telecast of this season (January 12, 2008) the Met finally got around to one of opera’s great masterpieces. Unfortunately Macbeth is not performed as often as its worth merits. In fact it wasn’t first performed at the Met until February 5, 1959 with Leonard Warren and Leonie Rysanek as the Macbeths. I remember that performance vividly. It was Rysanek’s Met debut. She was perfect as Verdi’s bloodthirsty Celt. Warren was as good as one can hope for in the title role which is just about as demanding as Rigoletto. As a bonus Carlo Begonzi was Macduff. Why the opera is not performed more is difficult to fathom. While you need a great soprano and baritone it doesn’t require four great voices like Il Trovatore nor three like La Forza Del Destino or Otello, not to mention the five needed for Don Carlo. In this production Serbian baritone Zeljko Lucic sang Macbeth in place of the announced Lado Ataneli. Lucic has a big voice that while not Italianate, like that of Warren or Sherrill Milnes, still was fine for the part. He did well for two thirds of the opera but started to fade at the end of act 3 and was completely spent by the time “Pieta, rispetto, amore” arrived. Verdi owned the patent for making his villains sing like an angels, but Lucic’s fatigue dulled the effect that this moving aria should produce. “Mal per me” was cut, just as well. 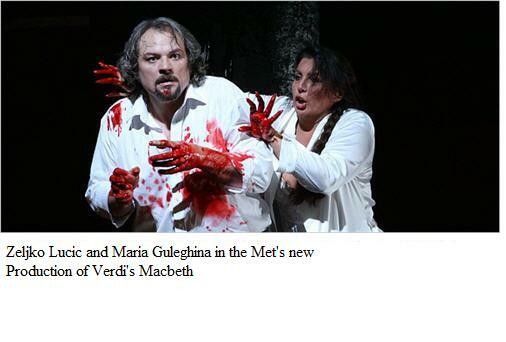 Maria Guleghina has a huge voice that is just right for Lady Macbeth – forgetting that she’s a queen for 75% of the opera. Unfortunately she’s a little late in her career for this hugely demanding role. She was effective for most of the opera, but just completely missed the pianissimo high d-flat at the end of the sleep walking scene – one of Verdi’s most inspired creations. Still she did as much with the role as anybody currently active could manage. The first meeting of the power mad couple at their bed clearly conveyed the sexual power that Lady Macbeth has over her husband. Forcing her to do a latin two-step during the second act brindisi was worthy of appeal to the Supreme Court. John Relyea was splendid, both vocally and in appearance, as Banquo. The young Canadian bass-baritone already sung more than 130 performances at the Met and seems ready to move up to bigger and more important roles. Native New Yorker Dimitri Pittas (Macduff) sang “Ah, la paterno mano” with feeling and finese. He too may be ready to move up. He also showed that he could cry on cue. He teared up when reading the news that his family had been killed by the Macbeths. And he’s not even running for office. His tears were likely invisible to the Met’s house audience, but they were very easy to spot on the video close up. This was the first telecast that went overboard on closeups. They were too many of them and they were intrusive. Russell Thomas managed to make something out of the few notes assigned to Malcolm. I’d like to hear him in a bigger part. Any Verdi performance is critically dependent on the conductor; so I was wondering which James Levine would show up – slow and lethargic or animated and dynamic. I was a little worried when he arrived in white tie and tails for a matinée; the fashion police are definitely going to raid the Met. Levine has lost weight and looked better than he has for years. His conducting was right on the mark. The orchestra played with fire and intensity that underscored the score’s many dramatic moments. For example, the first act finale – one of Verdi’s best – evoked the right mix or awe, horror, and drama. Levine was equally up to the score lyrical turns. The chorus sang perfectly, but the women looked like rejects from a Dorothea Lange photo shoot. Adrian Noble set the opera’s time in mid 20th century and dressed the men like Tito’s partisans. The chiefs looked more like a Serbian veliki zupan than a Scottish thane. Ostensibly, the reason for updating the opera’s chronology was to underscore its universality and relevance to today – “Patria opressa” and all that. But Verdi had already taken care of that with his music. No directorial intervention was needed. Macbeth by William Shakespeare with additional dialogue by Sam Schwartz. At least the audience didn’t boo as they did at Peter Hall’s production of the opera 25 years ago. How come the witches who can tell anyone’s future don’t know who’s coming in the first act when Macbeth and Banquo enter? Regarding the broadcast transmission , the sound was way too loud and there was a serious glitch in the middle of “Pieta, rispetto, amore”. But despite these cavils Verdi’s genius was undiminished. Good singing and great conducting carried the day. 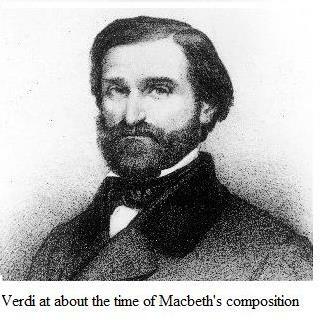 Though dead 107 years Verdi manages to get better year after year. In the theater there is Shakespeare and Verdi – then everyone else. The two together can be pure magic. Manon Lescaut is next while Tristan und Isolde looms in March. My wife is making noises about wanting to go. She says she’ll go alone if I don’t care to attend, but I know that means I sleep on the couch with the Great Dane if I take her at her word. Io fremo.